I was pleasantly surprised by this book. It was published through Deseret Book-affiliated companies, so I figured it wasn't good enough to get picked up by a larger, national publisher. My son read the series, as far as it has been released, and was nuts about it, so to be honest, I kind of wrote it off as a kids' story. Then Liz read it and said it was good so I gave it a go. It was much better than I was expecting. 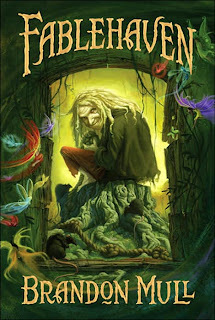 I was expecting characters with no depth and a contrived plot that just follows archetypes of fantasy literature, and what I got instead was a unique fantasy world that, thought it has your normal mythical creatures in it, does it in a fresh, new way, and with characters who are pleasant, believable, and interesting. I give the story a 9 out of 10. The audiobook is not quite up to what I would like. The narrator puts a little too much enthusiasm into his inflection, making it feel every now and then like he's reading to young children. His voices, though, are good, and for the most part, doesn't detract from the story. I'd give his narration a 7 out of 10, for a combined score of 8 out of 10 for this audiobook. It's worth the money.